Melt in microwave until there are no clumps. Stir to make sure that borax is completely dissolved. Slowly drizzle the borax mixture into the oil mixture, while mixing with a hand mixer. When it is the consistency of mayonnaise, add any fragrance. Let it sit for about 6 hours, then rewhip until it forms soft peaks. Spoon into jars. You can substitute different oils, but make sure that they are the same consistency (for example, liquid for liquid, solid for solid). Beeswax candles are long burning and give off a wonderful light honey smell. Use a larger diameter wick than you would use for similar size paraffin wax candles. Melt 1 part beeswax and 1 part mineral oil together. Allow it to cool, then rub on the wood item. Wipe off the excess beeswax mixture with a clean cloth. This works on wood cutting boards, too. You can rub beeswax directly on skis, toboggans, and other wood items to reduce friction as well as to protect from damage. Rub a thin coat of beeswax on wooden rails to make wood drawers slide smoothly. Use beeswax to draw designs on both sides of a fabric. When the cloth is dyed, the color will be absorbed by the uncovered cloth areas but resisted by the waxed design, thus creating a light pattern on a dark ground. Wax is removed by boiling or dissolving, and the process may be repeated. #5: sewing and beading Beeswax can be used to coat both a needle and the thread. It helps the needle to pull through without snagging, and it strengthens the thread. This works for Beading, too. Melt equal parts beeswax, tallow, and neatsfoot oil in the microwave. Use a rag to rub it on your work boots or gloves. Melt 4 ounces of beeswax, 1 teaspoon lanolin (can substitute petroleum jelly), and 1 tablespoon olive oil together. When cool to the touch, knead with hands. Try coloring with natural dyes. Mix equal parts beeswax, olive oil, grapeseed oil, and apricot oil. Melt in microwave until all of the beeswax is dissolved. Pour into lip balm containers. You can substitute different oils according to preference. Add a little bit of honey for flavoring! Use a match to melt some beeswax onto the letter. Press with a seal. Mix equal parts melted beeswax and grated soap until the mixture is smooth. Color with concentrated food coloring paste and pour into muffin tins lined with aluminum foil. Melt 1/3 pound beeswax and mix with 1 quart turpentine. Brush it on metal or bronze and then rub with a cloth to create a thin, hard protective coating. Mix 1 part Mineral Spirits, 1 part Linseed Oil, and 1 part melted beeswax. 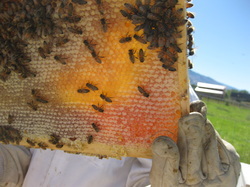 Adjust the amount of beeswax so that it has the consistency of motor oil. Rub it on ironwork for a beautiful sheen and to prevent rust. Mix equal parts beeswax and petroleum jelly, and melt in microwave. You can adjust the stiffness by increasing or decreasing the amount of petroleum jelly. Rub melted beeswax onto concrete counters or tables to create a muted, natural luster. Pysanky is an ancient form of folk art from the Ukraine. Use a stylus to apply melted beeswax designs onto a hollowed egg. Dye the egg. You can now add more beeswax and dye with a darker color. Continue until you are satisfied with the design. When the dye has dried, hold over a candle and gently wipe away the melted wax to reveal the beautiful multicolored design.